Getting your first geometry box was probably one of the most exciting moments of studying maths in primary school. It felt like you were finally going to be a part of this secret world that you could only admire from afar earlier while watching your older siblings or seniors at school study. It may seem it’s only the packaging or the prices that are different, but there several other things that you need to check before you actually buy a geometry box. In this article, we will explain how you can choose the best geometry box or geometry set for yourself, and also give you a list of the top 5 best ones on the market. If you want to choose the best geometry box for yourself, then there are a few factors, aside from the design and the cost, that you need to take into account. Let’s face it, until we reached high school, many of us had no clue what the set squares were even for; they were often reserved as mere substitutes for a ruler, because you knew you were bound to either break it or lose it sometime. 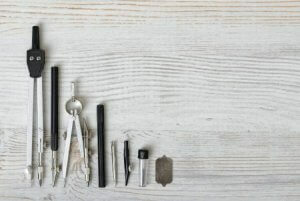 Therefore, if you’re buying a geometry set for your kid, consider whether they really need all the instruments. If it’s for younger kids, then a compass and scale should be sufficient, because they’d be doing simple geometry until around class 3. 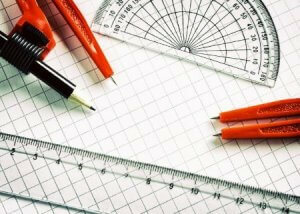 For older students though, the needs would depend on their fields of study, architecture design students would definitely need a protractor, while fashion design students wouldn’t necessarily long for it. Both the costs, as well as the quality of products, can vary a lot between different brands and models, therefore it can be hard to decide whether you want to spend a little more and get a higher quality. We would suggest you decide your budget based on the age of the user. 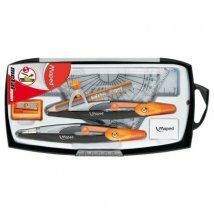 Primary students are usually less careful about their belongings, so we’d suggest going for a cheaper geometry box for them, but if you’re buying one for older kids, we’d recommend spending a little more and getting a better quality one, as it’s not only the quality but the accuracy the products provide that would be important for them. With the tips we mentioned earlier, you should be able to choose the best geometry box for your needs. To make the selection process a bit faster, we shall introduce you to the top 5 best geometry boxes you can buy online in India. This technical compass is perfect for drafting and is highly recommended for engineering and architecture students. 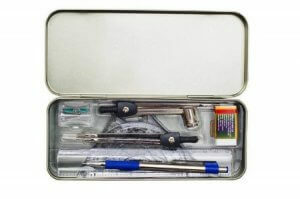 It is compact yet sturdy, and you can even fold it and carry it in your pocket, without worrying about it hurting you. It comes with various attachments that you can use to customise it based on your needs. Although, since it doesn’t come with instructions, it could be hard figuring out how to use all the different parts. Additionally, while it is great that you can lock in the measurements, or get an arc of up to 22 centimetres with the extension since it doesn’t have set squares or a protractor, it may seem too expensive to some. This geometry box has the most affordable price tag on the market and contains all the instruments you would need. 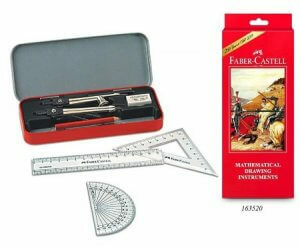 It would be great as the first geometry box, for students who are just starting out, and to add to their excitement, it comes with a mechanical lead pencil, instead of a simple one like most others. Probably due to the low cost though, the quality of the plastic used isn’t too good, and it could break really easily. Furthermore, the tips of the compass and divider are not very sharp either, which could result in inaccuracies in measurements, although that shouldn’t be a huge problem for younger students. If you’re looking for a geometry box that would be useful for slightly older students, then this is the one for you. 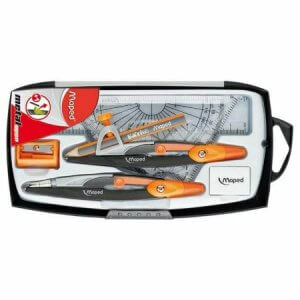 It is the only one that comes with a ruler that can be extended to up to 30 cm, and thus, would be especially useful for students who need something to help them with larger measurements. Aside from the ruler, it also contains all the other instruments you need for geometry, and instead of giving you either a mechanical lead pencil or a normal one, it gives you both. Additionally, the compass comes with an attachment you can use, whenever you need to use it as a divider. Considering all this, the price isn’t bad at all! One of the most affordable geometry boxes on the market, this contains all the necessary instruments, and the quality of plastic used is pretty good too. 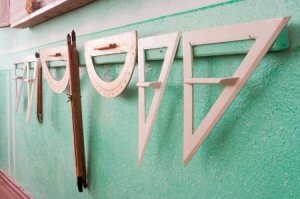 The scale, set squares, and protractor are all slightly thicker than usual, so they won’t break easily, but with gradually slanted edges, so accuracy isn’t compromised either. Since it’s such a budget-friendly option, it would be great as the first geometry box you get in class 1 or 2. 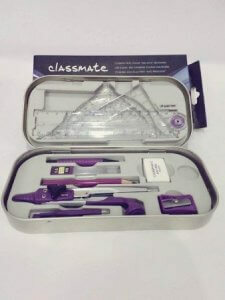 At the same though, since it is also a high quality and durable product, it would be absolutely perfect for middle or high school students as well. The best geometry box on the market, this is the one you should go for if you want maximum accuracy and precision in your work. You can lock measurements on the compass and divider, which minimises discrepancies, and if they start getting loose with time, you can easily tighten them using a screwdriver. As it is a bit expensive, instead of primary school ones, we would recommend it for middle or high school students, or even older ones who’re studying architecture or engineering, because it would be quite useful for them as well. It may still seem too pricey to some, but consider it an investment, as it will last you for quite a while. It’s a bit sad to see teachers having to struggle with drawing freehand figures on the board, but it’s even worse when they try to use the tiny little protractors and rulers to work on the board. Earlier, it was much harder to find mathematical tools you could use while teaching, but it’s not that difficult anymore. There are several options online that you could consider buying to make your lessons easier to conduct, as well as easier to follow. Geometry sets made specifically for blackboards and whiteboards are much bigger in size to make sure the figures are visible and have handles, so it’s easy to hold them against the board too. 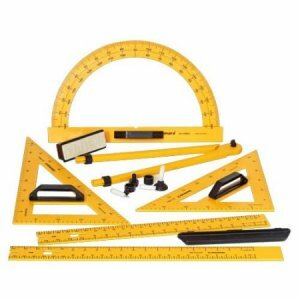 The only geometry set on this list that is specifically recommended for teachers, as this is made for blackboard or whiteboard use. Since the instruments are much bigger, they would make it easier to draw figures on the board, and they come with handles to make it easy to hold them against the board. The only downside to this product is that it is expensive, and might need some getting used to, but if you’re willing to make the investment, and spend a little extra effort to take your lessons to the next level, then this would be really beneficial for both you, as well as your students. Geometry boxes can be really hard to choose, and often we may choose simply based on the appearance or the cost. However, just like with everything else, we must try to understand what makes each of them different, to know which one would be perfect for our particular needs. We hope after reading our article, you feel a bit more prepared to choose the best geometry box, and we also hope that our list of recommended products has made it easier for you to know which one you’d want to go for.